The weather may have been interchangeable but the people's love for our spiced-chocolate tarts was just as constant as last weekend. The rich dark chocolate remained the most popular with subtle tones of chai infused into the smooth chocolate filling. The white chocolate was as ever, the surprise of the stand with people instantly converted to buying one after just a small taster. Passers-by were comforted with a cup of a freshly-brewed chai and a warm chocolate naan to get them through the cold front and were a hit with the little ones due to the low sugar content. 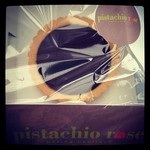 The most encouraging part was people's excitement about Pistachio Rose and the fact that it was different to anything that's out there. 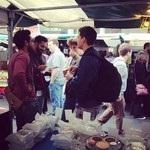 They loved the concept, the taste and were recommending other markets they'd like to see us as at. 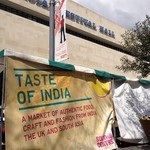 We'd like to thank @RealFoodFest & @Southbanlondon for letting us be a part of this great market. We'd also love to thank @stylistmagazine for their re-tweet about our chocolate naan - much tweeted about this weekend! We'll be back in 2 weeks time on 28th at Brixon's @MakeGrowSell where we'll be entering our products into the Great Brixton Bake off Competition so please support us!